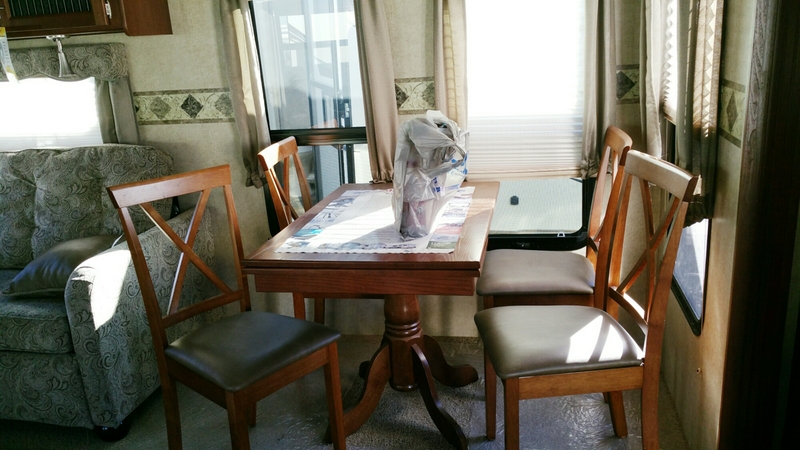 I really love living in an RV, but there are a few things that I took for granted in our sticks and bricks (which is what people in the RV community call a normal house built on the ground), or s&b, home that I absolutely miss now. This list is different than what my husband would probably write, so maybe I will have him to a guest post. 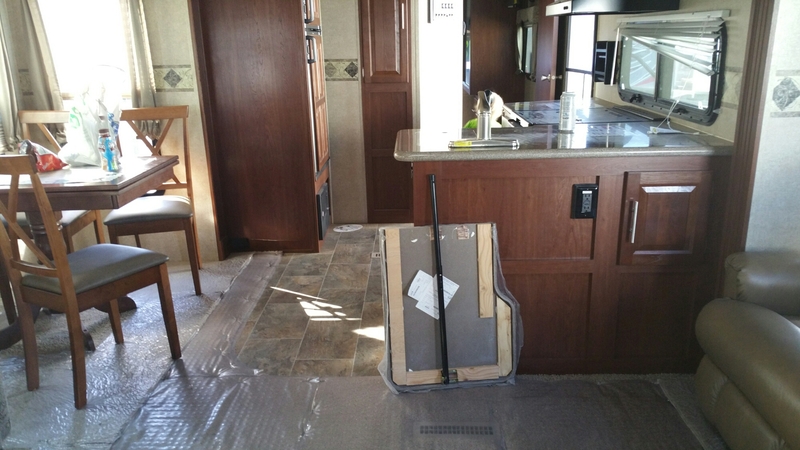 Also, some of these things that we are lacking may just be because of our travel trailer, not for all RVs. You will see as you read the list. 1. Bath Tub: I didn’t realize how much I would miss having a bath rub until now. It isn’t like I used one often, but it was nice to have it as an option if I needed a relaxing soak. The kids really miss having a bath rub. I supposed I could buy a little storage tub and use that, but I don’t think it would be big enough for the both of them, and they love doing things together. It would make my life so much easier if we had a tub. These kids hate having water over their heads and it is pretty difficult to avoid that in the shower. Of course, when it came time to wash their hair, water would go over their head, but it was more controlled in the tub. If we had a tub, we would clearly have a a larger shower, which I also miss. 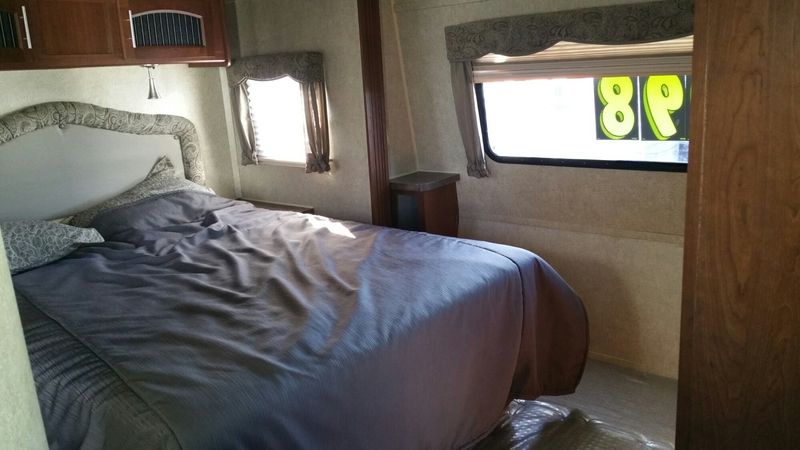 Some RVs do have bath tubs, but none of the 5th wheel models that we liked had them, so it seems we won’t have one until we move back into a s&b. 2. Washer/dryer: I absolutely hate going to the laundromat. I try to avoid it at all costs, which means that instead of me doing the laundry, I let it stack up until my husband volunteers (basically forced) to do it. I almost feel badly for it, but I don’t. I just hate going there so badly. There at least is a laundromat at the RV resort, but that still means I have to lug a large bag (or 2) full of laundry, 2 kids, and the detergent to the laundromat, That either means I have to load it up in the car or juggle the kids and the laundry in the stroller. Either way, it takes way too much work and I hate it. There also isn’t a lot of options when it comes to selecting a cycle for the load, so that is a downer. 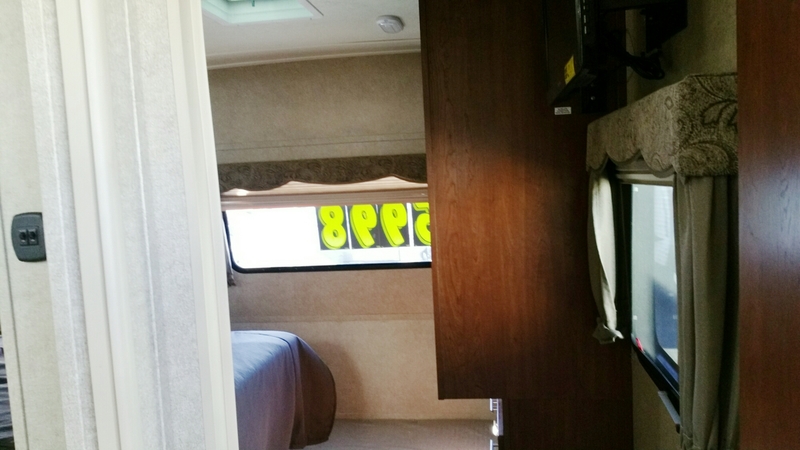 When we move into a 5th wheel, the model we are looking at has a washer and dryer hook up in the master bedroom. It will, of course, have to be a small washer and dryer, but at least we can have one in the rig. 3. Good Water Pressure: It is barely a trickle of water when we take a shower. I would be better off trying to take a shower in the pathetic “rain” that California gets. Okay…maybe it isn’t that bad, but it still has really low water pressure. I am not saying that I want a shower that feels like it washes off the first few layers of skin it is so high, just a nice modest amount. It also seems to have gotten worse. We probably need to get some kind of filter. I am sure there probably is some mineral deposits in the shower head or something. 4. 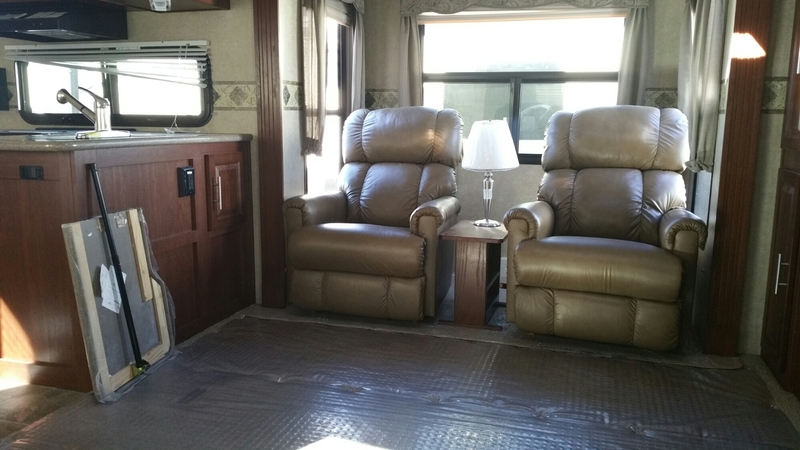 Large, Comfortable Couch: We actually have a lot of sitting space in our RV, but the couch that we have is so uncomfortable. It is stiff and ugly. It barely fits me length wise (I am a shorty) and it isn’t very wide, so it isn’t easy, or comfortable, for me to nurse my daughter to sleep on it. The pillows that came with it were hideous and stiff and now they are in the trash. The couch we had before was so big, wide, and so comfortable that you never wanted to leave it. We also have two recliners and they are incredibly comfortable, but I am much more of a large, comfy couch person. 5. Large Refrigerator: From my last post you can see exactly how tiny our fridge is. It is barely bigger than those tiny little fridges that you would find in a cheap hotel room. It is so difficult to shove all of our produce and other perishables into our fridge. We somehow manage to fit more than a weeks worth of groceries in there, but when we do, you can barely find anything. It is like a game of tetris trying to find ways to fit everything in there and still close the damn thing. Our freezer is incredibly tiny, too. On the bright side, it no longer smells rotten. Some of the 5th wheels we looked at have either a double tiny fridge or an actual full sized fridge. There is hope for our future. 6. 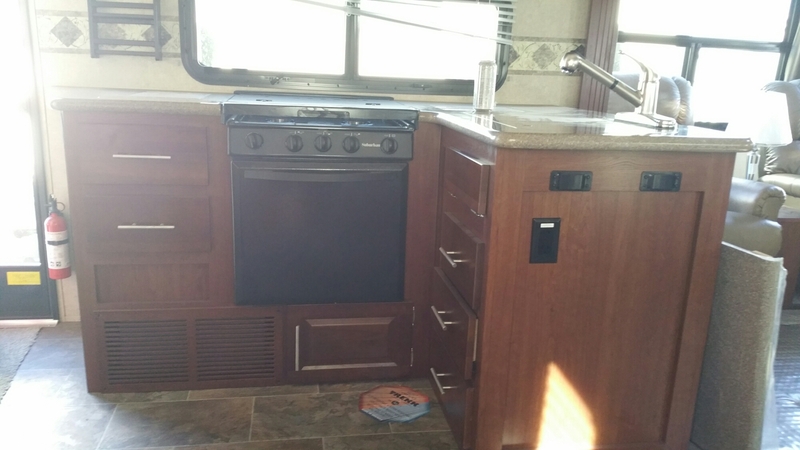 Gas Stove/range: I wasn’t an amazing cook before we moved in to the RV, but I feel like I am even worse now. It isn’t particularly easy to cook on a propane range and is so difficult to get the temperature right. We don’t use the oven because it would eat up the propane too quickly and it really costs to fill up the propane tanks. Because of that, we use a convection use since we do not have to pay for electricity. The convection oven isn’t so bad to use, but we cannot have the convection oven and the AC running at the same time, so I have to turn off the AC. It is way too hot to turn off the AC this time of year. We have done it a few times and instantly regret that decision to bake anything for dinner. The times I forget to turn off the AC I instantly regret it because then the breaker pops and I have to go outside and flip it back on because it overloads the 30amp. The other thing that I hate about cooking on the rig is that it isn’t always perfectly level, so food doesn’t always cook evenly. There is just so much wrong with cooking. I still do cook because I want our family to eat healthy foods, but it just leaves a lot for me to grumble about. You may be surprised to not see “more space” or “dishwasher” on the list. I honestly do not mind the fact that we have less space for things. I enjoy living in a smaller space and having less things. I have found that I do not need a dishwasher. It really isn’t that difficult to keep up with the dishes if I was them more often, and it isn’t a pain to wash them more frequently, either. 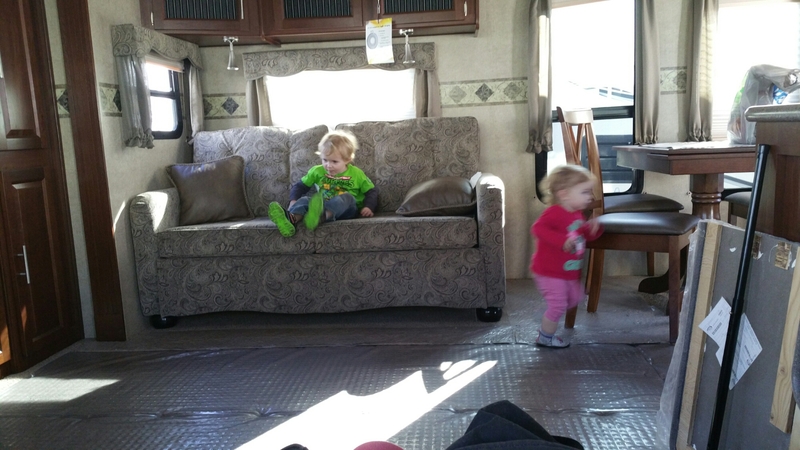 Yesterday, we went to the RV dealership to try and get our dream trailer for good price. 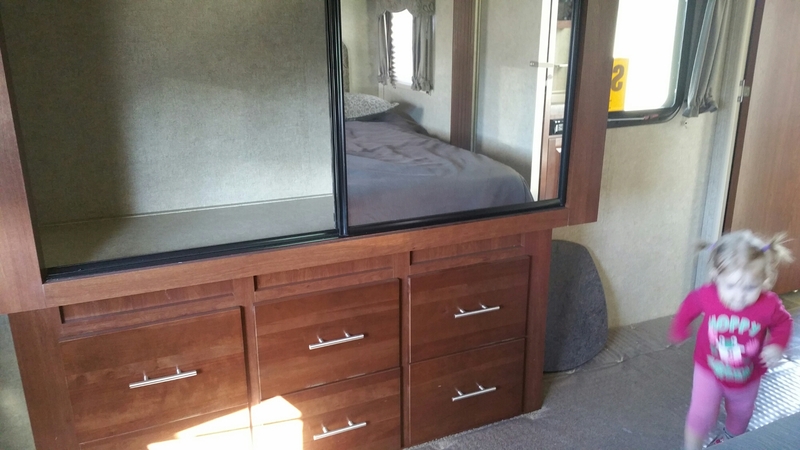 Our dream trailer is a 2014 Rockwood that was just put of the price range that we wanted, but we just really love that layout and had not found anything comparable. So, we tried one more time to haggle and get a lower price, but they wouldn’t budge. 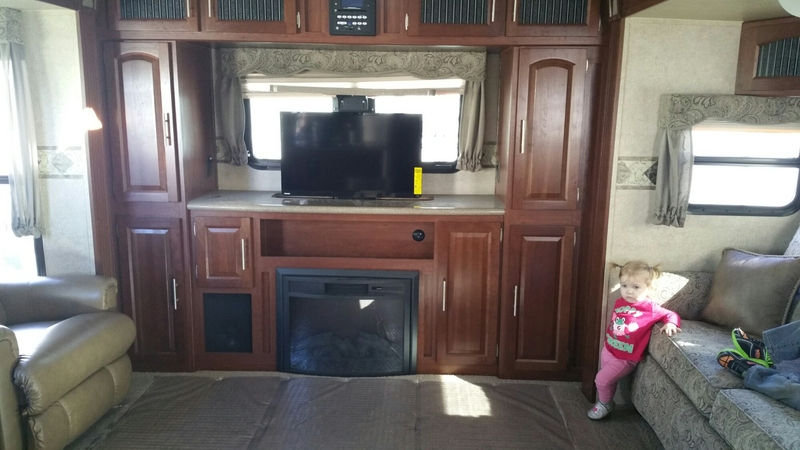 My husband and I decided that we needed that extra living space which is why we decided to go with that one trailer, which is a relief since we would have needed to travel further to find a good RV. Electric is a perk since then we won’t have to use up all of our propane for heating. Both kids will be sleeping with us, so this can be for guests or for if our son wants some space as he gets older. I really hope I can find some comfy alternatives for the couch. It’s a little stiff. This is the feature that convinced my husband. 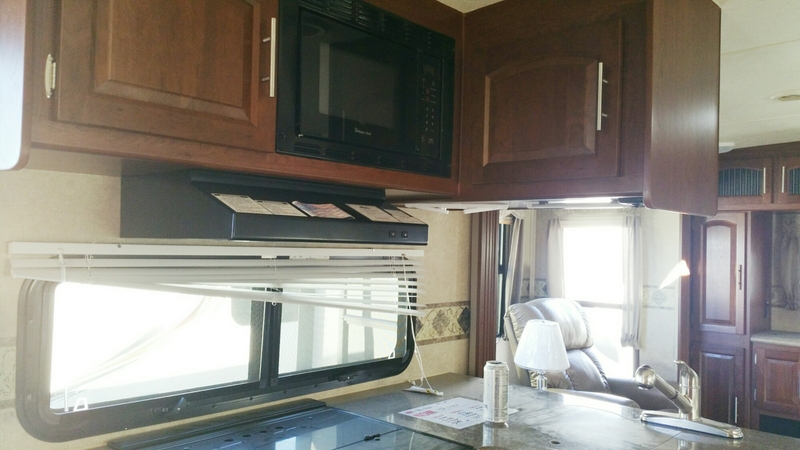 My husband was still on the fence when touring RVs until he saw this layout. He loves the idea of so much floor space because of the two slide outs here, and also having a recliner. Everyone needs a recliner. Clearly, there is a lot of room in the living area. At first, I thought, lots of storage!, but no…there isn’t. 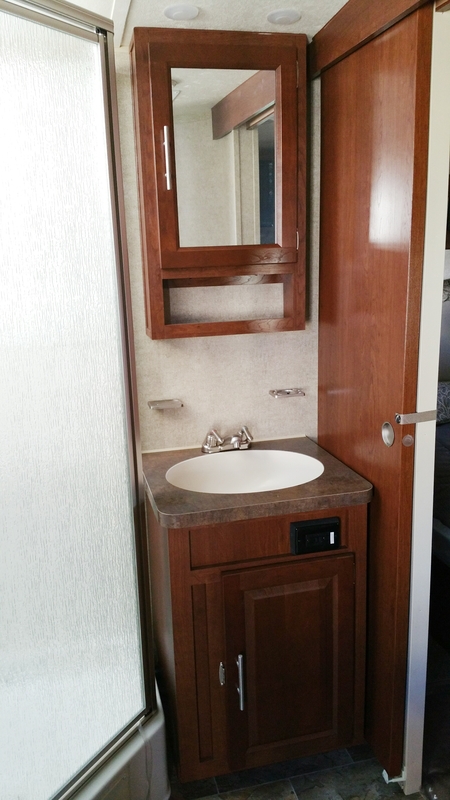 I guess when you are looking at so many trailers, though, that two cupboards seems spacious. It’s all relative. We will be using a booster for our youngest and it will be nice to be able to pull the chairs in the kitchen for the kids to stand on and help out with things. We really don’t spend that much room in the bathroom. It will be an adjustment to only have one toilet. I keep on trying to think of ways to get a tub for the kids to have a bath, but there really isn’t a way. You give and take when you minimize. We plan on limiting the amount of clothes we bring, which really won’t be too hard for us since neither one of us are big into fashion. It might be s little challenging with the kids, but we will manage. 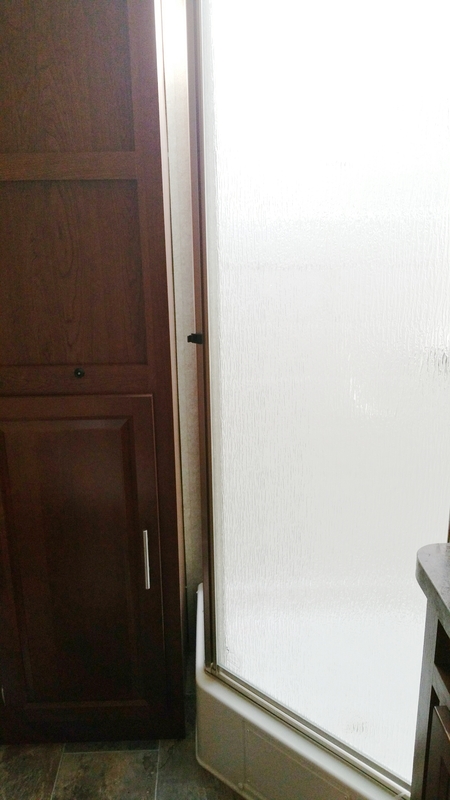 Now that we have our trailer, our next step is to limit our belongings. We will be getting a storage unit, but we still don’t want to be wagging around a lot of things that we don’t use. Once our debt is paid off, we will save money to buy nice, new furniture…after we get a house, of course. We’ve already sold our couch and kitchen table plus a couple shelves. We are also giving away a lot of things, too. Our issue, as a couple, is that we are terribly lazy. Really. It’s a disease. We need to get up and just do it. We have tons of toys and clothes to sort through. I don’t feel like the difficult part will be letting go of our belongings, but actually sorting through all of the junk. So. Much. Stuff.